The term ‘Bheto’ originates from Bengali word ‘Bhaat’ (rice) and ‘Bheto’ the person who loves to eat rice. I still remember, during childhood I used to fantasize marrying a ‘Jele’ (fisher) so that I can have various fish items. Yes am a typical ‘Bheto’ & ‘Mechho’ Bong’ 😉 !!! Bengal has been always blessed with green fields and rivers (West Bengal/ East Bengal, now Bangladesh). Fishery is one of the main professions for a huge population. But with the growth in head count, the demand and supply curve is getting affected. To satisfy our requirements /greed/palate we are sourcing fish through wrong routes. A simple study shows how this can affect and drive us towards a scarcity of our favourite food items if we do not react responsibly. Seafood Sustainability is such an importance subject! The staple food of people in Bengal is rice and fish. A typical Bengali needs to have fish in every meal.. There is an ample stock of fish in every household, because fish is cooked frequently, almost on a daily basis. But is the trend continuous it will create an adverse situation in near future. Next generations will only know few names, since by then they have either became endangered or extinct! Sustainable seafood is seafood that is either caught or farmed in ways that consider the long-term vitality of harvested species and the well-being of the oceans, as well as the livelihoods of fisheries-dependent communities. It was first promoted through the sustainable seafood movement which began in the 1990s. This operation highlights overfishing and environmentally destructive fishing methods. Through a number of initiatives, the movement has increased awareness and raised concerns over the way our seafood is obtained. 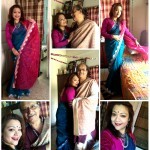 44/100 of #100sareepact is a cotton designer saree, where the theme is water & fish. 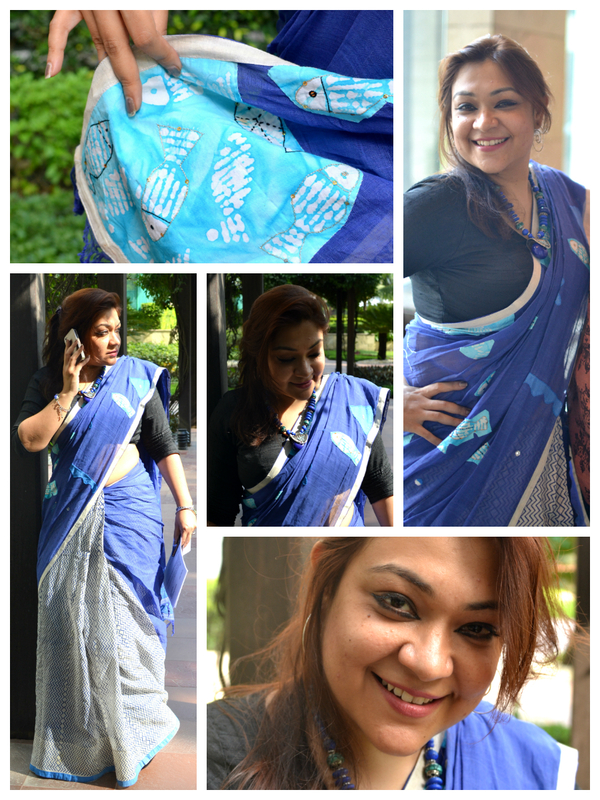 Yes it’s one of my #ShadesOfBlue sarees, a design with white /blue and beautiful appliqué works. The subject is very close to my heart and tells a wonderful story. Old Wine in New Bottle!